Interactive Furniture Design is an experiment in parametric modeling. I built a system that takes as input the image of the silhouette of a seated person. Then, it iteratively grows a chair that matches various constraints. The chair is constrainted to match the profile of the image, balance by itself, and balance when the user is seated. The surface back must be smooth and have ergonomic curves. The user can tweak constants that weight the different constraints to achieve various aesthetic results. The result is a system that allows the user to design a customized chair. 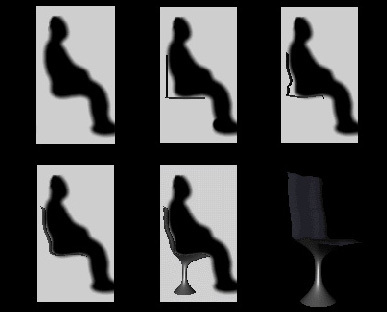 The chair is modeled as several deformable meshes that change shape iteratively until the most stable configuration is reached under the various constraints. I wrote a technical paper on the project, see it here. Please visit a gallery of the designed chairs.